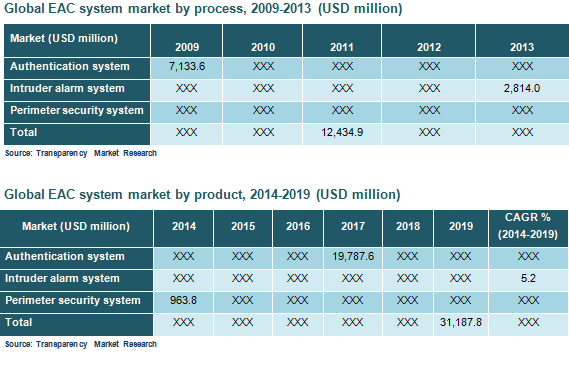 According to TMR, the global electronic access control systems market is projected to reach US$31.188 bn by the end of 2019 progressing from US$15.40 bn in 2014. During the forecast period between 2014 and 2019, the market is projected to expand at 12.6% CAGR. Based on product type, the authentication systems is expected to lead the market in the coming years. In 2013, the valuation of this segment was US$11.7 bn and is expected to reach further during the forecast period. On regional front, Asia Pacific is considered one of the key regions for the growth of this market. During the forecast period between 2014 and 2019, this segment is projected rise at 16.7% CAGR and reach a valuation of US$9.6 bn by the end of 2019. Globally, increasing illegal activities and need for high-level security have increased the demand for electronic access control systems. The use of electronic access control system provides better accuracy, convenience, and are time efficient as compared with other security devices their demand has grown further. Moreover, the growing popularity of electric strikes and electromagnetic locks has also contributed in the growth of this market. The use of innovative technology such as biometrics that are accessible through sensors by using mobile phones is also driving this market. The need for electronic access control system has increased in healthcare centers, educational institute, and residential buildings benefitting the growth in this market. The prime use of these systems is done to track and minimize criminal activities, fraudulence, vandalism, and various their illegal activities constantly taking place in numerous cities and towns across the globe. On the contrary, high cost of electronic access control systems and lack of availability to skilled staff to manage these devices have hampered the growth of this market. These restraints are generally noted in emerging economies where availability of skilled staff inadequate. Thus, the above-mentioned restraints are likely to obstruct the growth of this market. However, players in the market are expanding their business in emerging economies and are expected to regulate the prices by using innovative technologies that will increase the efficiency of these devices. This might help in reducing the effects of these restraints and fuel the demand in the electronic access control systems market.